Hot on the heels of the release of WordPress 3.7, WordPress has released the next major release, 3.8 (“Parker”) today. This new release is all about aesthetics and a better user experience on the admin end. This release introduces a brand new, modern user admin interface, so when you first log in after upgrading, the changes are very noticeable. Don’t panic! Functionality has not changed, and you will still be able to perform all of your routine tasks in nearly the same manner as you always have. Beautiful new typography using the Open Sans font (a favorite of the Webscaper!). The font is also slightly larger, further improving the user experience. Brand new vector-based icons. Not only are they pretty, but by using vector-based icons, page load of the admin screens will also be improved! Redesigned Widgets screen. I mentioned above that functionality hasn’t changed, and it really hasn’t. The new Widgets screen would be the feature that comes closest to being called a functionality change. Instead of the Available Widgets being listed at the top of the screen, they now run along the left side of the page, which for most typical users of WordPress will mean no more scrolling up and down will be necessary when dropping widgets into widget areas. An awesome improvement! Adaptive interface will display beautifully on whatever device you prefer to use… large monitors, small monitors, tablets, even cell phones! 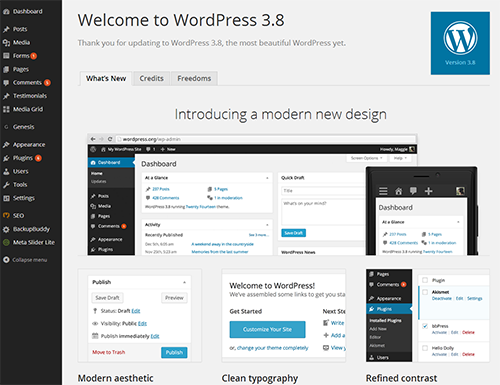 In addition to the interface changes, WordPress 3.8 introduces a brand new default theme, Twenty Fourteen. Improvements were also made to the Themes screen, allowing users to scroll through and preview available themes. The Webscaper will be updating all Virtual Webmaster client installations of WordPress. If you do not wish to have updates made as part of your Virtual Webmaster plan, please let us know. 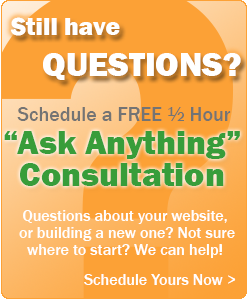 For non-Virtual Webmaster clients and non-clients, contact us and we will be happy to assist you with your update.